A Home for All event at the Millyard Museum and were moved by the personal stories shared by the refugee panelists. Inspired by their experience at the event, the couple decided to demonstrate their support for immigrants by raising awareness of the challenges refugees face. The Traegers hosted a house party for their friends and neighbors at which IINE staff and newly arrived refugees spoke. The event raised money to support IINE’s services, introduced the community to several refugee families, and helped people learn more about the U.S. refugee resettlement program. But Mark and Heidi didn’t stop there. They also worked with IINE staff to plan a Nature Walk on their own property. IINE brought nearly 200 refugee children and parents to the Traegers’ home in the country to hike, fish, and learn more about New Hampshire’s great outdoors. They did it again a few months later when they hosted another busload of children who arrived for a fall adventure of fishing and Halloween fun. 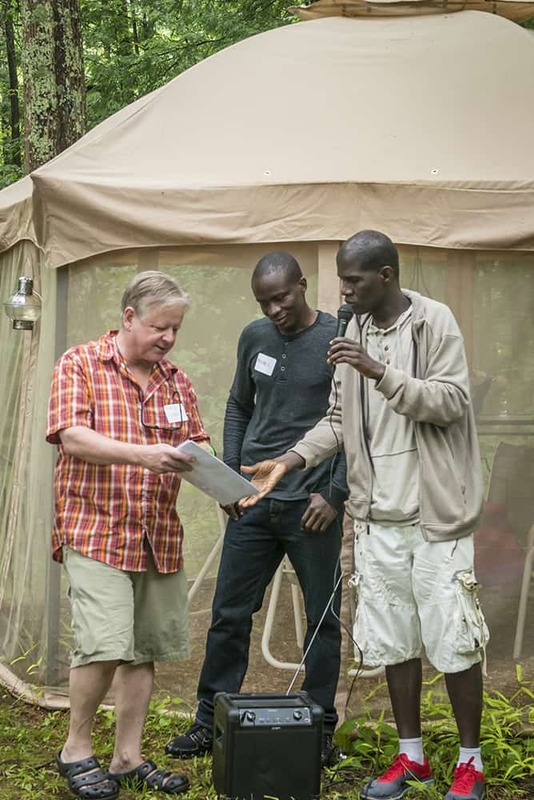 The Traegers’ refugee and immigrant guests at the three events delighted in the bucolic scene and the warm welcome they received from Heidi, Mark, and their neighbors. The Traegers are unassuming and don’t think that what they’ve done for the refugee community in Manchester is all that extraordinary. But their generosity and kindness goes beyond financial support. The value they place on relationships, on understanding where people come from and what they have endured, helps empower refugees to know a wider community of people. During a year of uncertainty and insecurity for refugees and immigrants, it is heartening to see the Traegers and families like them offer a warm New Hampshire welcome to new Americans. To support IINE programs in New Hampshire, click here. Interested in volunteering in one of our programs, or in a specialized way like the Traegers? Attend one of our upcoming Volunteer Information sessions, held the last Monday of every month at all three IINE site offices.